New-vehicle sales in Canada fell for the seventh consecutive month in September as automakers sold 175,290 units, down 6.4 per cent from last year, according to the Automotive News Data Center in Detroit. Overall, year-to-date sales in Canada stood at 1,577,476 through September, down 1.1 per cent. “The automotive industry has enjoyed eight years of sustained sales growth and in a very cyclical industry, this type of growth has been exceptional,” David Adams, president of the Global Automakers of Canada, said in a statement. Adams says annual sales could still hit two million units. Ford sold the most vehicles in September and retained the overall sales lead. The Ford F-series pickup also remained Canada’s best-selling vehicle through September, while the Honda Civic remained the best-selling passenger car. Trucks comprised 71.5 per cent of the market in September compared to 69.4 per cent in 2017, according to the GAC. DesRosiers Automotive Consultants said uncertainty from North American trade deal negotiations, which ended in a deal Sunday, might have contributed to the drop in sales but that numbers could rebound with a deal in place. "With the signing of the deal and the threat of tariffs to the Canadian auto industry withdrawn for now, the consumer confidence issue may be alleviated for the final three months of the year," the consultancy said in a note. Ford Canada is pleased with sales of its redesigned Ford Expedition and Lincoln Navigator, but neither could stop the automaker’s September sales from falling 14.1 per cent. Ford sold 26,531 vehicles last month. Expedition sales stood at 167 in the month, up 40 per cent, while Navigator sales totalled 110, up 279 per cent. But the volumes were too low to offset losses elsewhere in the automaker’s lineup. Ford’s car sales were down 33.7 per cent while truck sales fell 11.8 per cent. Those numbers include the luxury Lincoln line. GM Canada’s September sales were 25,566 units, down 6.1 per cent when compared with last year. Car sales were down 6.5 per cent to 4,757 units while truck sales dipped 6.1 per cent to 20,809 units. The automaker didn’t immediately provide a breakdown by nameplate. Nissan Canada sales, including its luxury Infiniti division, were essentially flat in September, down just 0.5 per cent to 13,373 units. The Nissan brand had September sales of 11,929 vehicles, down 2.3 per cent over last year. Infiniti, though, had its best month of sales ever with 1,444 units sold, an increase of 18.2 per cent from September 2017. The Infiniti QX60 seven-passenger luxury crossover remains the brand’s best-selling vehicle with 537 units sold, an increase of 2.3 per cent. Sales of Nissan’s Qashqai compact crossover, launched last year, increased by 15.3 per cent with 1,790 units sold. Toyota Canada’s total sales fell 8.3 per cent to 20,187 vehicles in September when compared with last year. Total sales of both Toyota and Lexus cars and trucks were down. Only seven of the automaker’s 29 nameplates posted gains. The Yaris was the only Toyota brand car to post an increase, up 5. 2 per cent to 745 units. Sales of the Camry and Corolla were down 34.8 and 8.4 per cent to 1,141 and 4,304 units, respectively. Tacoma pickup sales were up 14 per cent to 1,246 units, but RAV4, Highlander and Sienna sales were all down. Sienna sales were down 38.7 per cent to 859 units while Highlander sales were off 8.9 per cent to 5,318 and the RAV4 down 3.8 per cent to 5,318 vehicles. Total Lexus sales were down 11.2 per cent with only the low-volume LX seeing a gain, up 7.5 per cent to 57 units. Subaru Canada sales rose 9.4 per cent to 5,622 vehicles in September. The Forester was the automaker’s top-selling vehicle with 1,373 units sold. The Crosstrek followed close behind with 1,356 units sold. The Impreza, with 881 units sold, was Subaru’s top-selling car. Fiat Chrysler Automobile sales fell four per cent in September and had it not been for the Jeep brand’s positive performance it would have been worse for the automaker. FCA sold 17,698 vehicles last month, down from 18,444 a year ago. 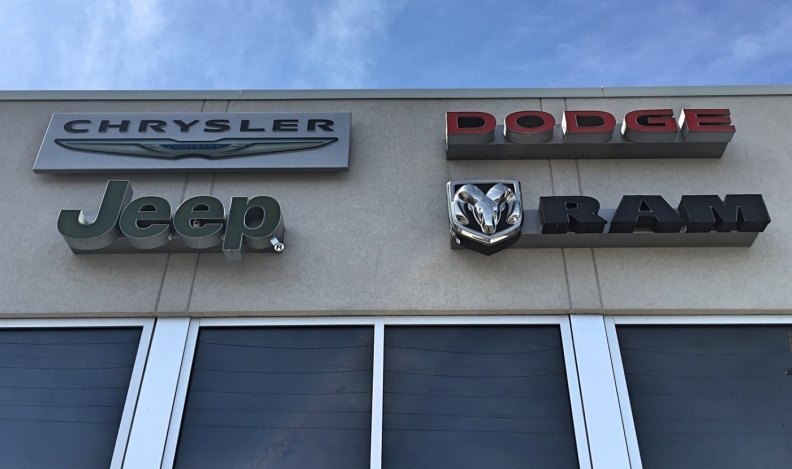 Chrysler sales were down 11 per cent, Dodge down 13, Ram down 11 and Fiat down 61. The low-volume Alfa brand was down two per cent. But Jeep sales surged 25 per cent to 5,033 vehicles. Wrangler and Grand Cherokee sales were up 62 and 31 per cent, respectively. Ram pikcup sales were down 11 per cent to 6,903 units. The Ontario-made Dodge Caravan had its sales sink 35 per cent to 2,533 units. The Chrysler Pacifica, also made in Ontario, saw sales slide 57 per cent to 191 units.